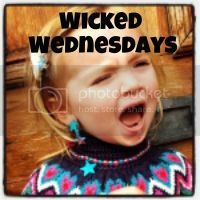 This weeks Wicked Wednesdays photo comes again at H’s expense (he’ll love me for it when he’s older) and for those of you who don’t follow me on Twitter you may have missed this little gem. Bless him!!!! My girl has just gone dry (2 weeks in) so I will make a mental note to always pack spares!!! !